Enjoy Hélène Darroze’s take on English Afternoon Tea in the Espelette, with its stunning conservatory overlooking the heart of Mayfair Village. It’s the perfect antidote to a day spent shopping or browsing the nearby galleries. 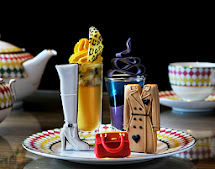 Chic & Shock Afternoon tea is served in Espelette Monday to Friday 3:00-5:30pm; Saturday and Sunday 1:30-5:30pm. Enjoy a warm and cosy festive afternoon tea in complete luxury, with the added delight of a harpist playing daily. A mouth-watering selection of finger sandwiches.